The machine shops of Paterson developed a reputation for employing the best men and producing the finest machinery in the United States. This is where the earliest machines that would spin and weave cotton were constructed and maintained. The first machinist to arrive in Paterson was John Clark, Sr. from Paisley, Scotland, in 1800. He set-up shop in the Society’s first cotton factory. Here built wool and cotton machinery primarily made of wood with some iron parts. The first machinist could be described as carpenter/machinists. 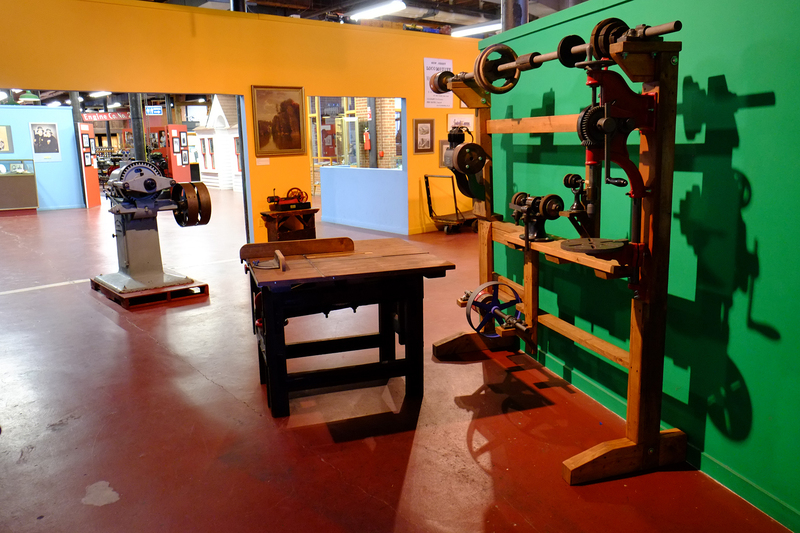 On display are a variety of the machines that you would find in a typical machine shop. Our most celebrated machinist is Thomas Rogers. He settled in Paterson in 1812, when the city was enjoying a demand for local made products as a result of the war with England (War of 1812). Rogers was renowned for his dedicated work ethic and inventive genius. Eventually, he partnered with John Clark, Jr., under the firm of Rogers & Clark. They set up works at the Little Beaver Mill on the lower raceway near Prospect Street. In 1831, Rogers withdrew from the company and erected his own factory, the Jefferson Works, near the upper raceway on Spruce Street. He intended to build machinery and engage in cotton manufacturing within the four stories of his new mill. However, the increase in orders for new machines made cotton production not practical. About this time, 1832, Mr. Horatio Allen, Chief Engineer of the South Carolina Railroad, approached Rogers with an order for 100 sets of railroad wheels and axles. Soon afterwards, Rogers became known for railroad car wheels and other castings as well as cotton and wool machinery. By 1835, Rogers had added several buildings with the future focus on railroad work and steam engines. Eighteen months later, he completed his first locomotive, the Sandusky. Over six thousand locomotives would be manufactured at Rogers by the time it ceased operations 1913. In addition to Rogers, Paterson was also the home of Danforth, Cooke and Co. and Grant Locomotive Works. The total number of locomotives produced from 1837 to 1926 amounts over 10,000.